Who says Oregon is famous for its rain? 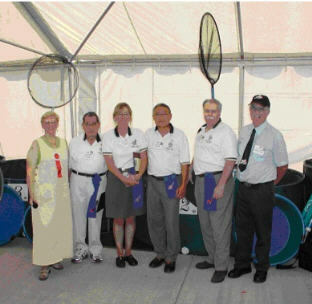 Judging of our 24th Annual Show was held on Saturday, July 24th, in 104 degree weather. It was Portland Oregon’s hottest day of the year. We have been grateful of our purchase of the beautiful white tent over our Koi tanks before, but no more so than this year, in the stifling weather. It was slightly cooler on Sunday, the 25th, but not so you would really notice. Saturday morning started out very warm. Our Show Chair, Virginia Hokkanen and her co-Chair, Leo Marsh, greeted the public and opened our Show, by introducing our well known and distinguished Judges. This year, we were honored to have James P. Riley, AKCA / ZNA Local Certified Judge, as our Head Koi Judge. Charles R. Poppe, AKCA / ZNA Local Certified Judge, Debbie Young, AKCA Koi Judge and Larry Gill, AKCA Koi Judge rounded out the team as our Assistant Judges. Scott Taylor was our prestigious Goldfish Judge. Left to Right: Show Chair Virginia Hokkanen; AKCA / ZNA Local Certified Judge, Charles R. Poppe; AKCA / ZNA Local Certified Judge, Debbie Young; AKCA Koi Judge, Larry Gill; Head Koi Judge, James P. Riley, AKCA / ZNA Local Certified Judge; and Scott Taylor, Head Goldfish Judge. Although the temperatures soared, our knowledgeable water quality team, headed by our President Mike Rice, kept our fish safe and protected with excellent water quality. Many worried about the fish’s safety, but they all came through with Living Jewel colors. Our Vendors got warm right along with the rest of us. The Sales Table crew, worked really hard. They sold everything fishy; fish windsocks, stuffed fish, fish sunglasses, tee shirts, books and other educational items, test kits, and other knick Knacks. Our Concession Stand duo, out did themselves. We even had Egg McKoi Muffins and Chicken Caesar Salad this year. Combined with our hot and polish dogs, kraut, rib barbeque, pizza, and exquisitely catered Awards Banquet, you can tell next to fish, we love to eat ! We had 8 Koi Vendors and two goldfish vendors in attendance, from all over the US. Several artists, some wonderful seamstress’s dashing needlework, a pump manufacturer, hand made Koi jewelry, Koi Shirts, and water plants to browse through. ? An awesome Auction was held on Sunday afternoon to help raise the money for next year’s Show…… I hope it is a lot cooler. Our Grand Champion was a beautiful Showa, owned by Bill and Marianne Blackburn. Reserve Champion was a Kohaku, also owned by Bill and Marianne Blackburn. Young Champion was a Sanke, owned by Leo Marsh and Virginia Hokkanen. 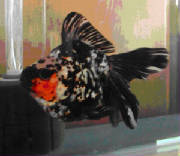 Baby Champion was a Kohaku, owned by Steve Huey. 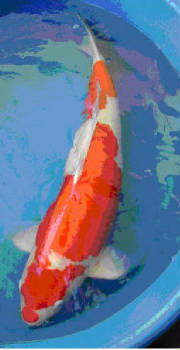 Best in Size 1 was a Kohaku, owned by Steve Huey. Best in Size 2 was a Shiro Utsuri, owned by Bob and Mary Johnson. Best in Size 3 was a Kin Gin Rin Showa, owned by Dan and Sharon Olson. 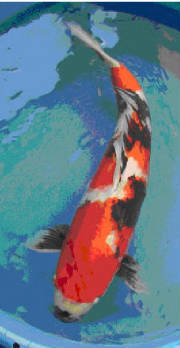 Best in Size 4 was a Kohaku, owned by Don and Joan King. Best in Size 5 was a Sanke owned by Dan and Sharon Olson. Best in Size 6 was a Sanke, owned by Jeff and Penny Thomas. The AKCA fish was a Kin Gin Rin Chagoi owned by Leo Marsh and Virginia Hokkanen. 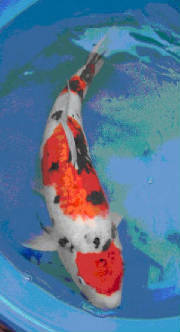 Grand Champion Goldfish was an Calico Ryukin, owned by Chris Jolly. Reserve Champion Goldfish was a Tamasaba, owned by Lulu and Ashley Pifer. Young Champion was a Pearl Scale, owned by Jeff and Penny Thomas.